With the help of this software, it becomes possible for users to migrate NSF to Google Apps or G Suite in bulk. It permits its users to shift mapped NSF files to mapped G Suite account with an ease. Apart from this, users can even import CSV file, which has the target accounts of Google Apps listed against NSF path for mapping various files at once. Users can migrate emails, calendar items, contacts from Lotus Notes. The Lotus Notes to Google Apps/G Suite migration tool allows resuming the process of conversion. With the help of this feature, it becomes possible to start the process from the same point where it has been paused. This can happen due to various reasons such as due to interrupted internet connection etc. The tool will display the previous conversion history detail such as successfully migrated mailboxes, detection of an error, and the obstructed migration. 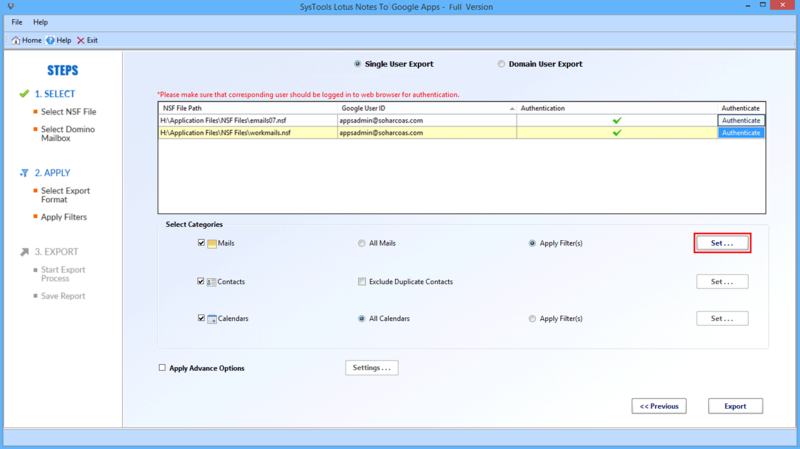 Users can easily migrate NSF to Google Apps with this Advance feature. According to this, users are allowed to map each NSF with the desirable account of Google Apps. 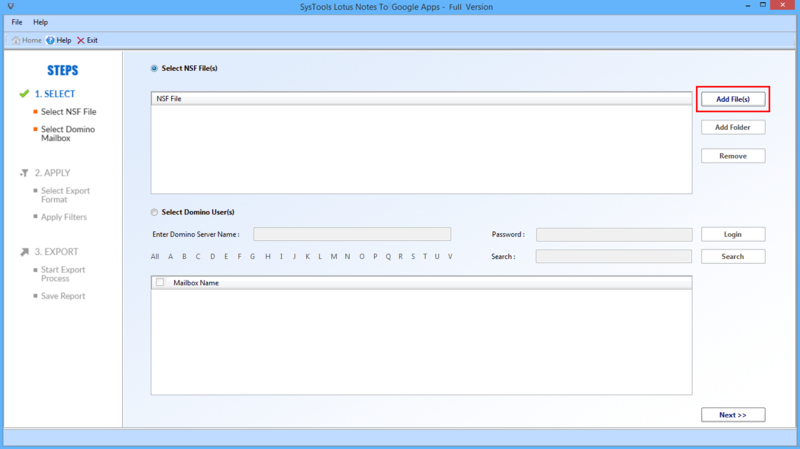 It is possible to move NSF file to Google Apps account of the particular user account. Moreover, for this, they need to add NSF file and in available field mention user name of Google Apps of their choice. Lotus Notes to Google Apps Migration tool permits to set a particular date range and implement filters on the data of migration. Users can export only the needed emails, calendars, and contacts within a specific date range. In order to do this, they need to give “To” and “From” date. Once it is done, the required data will be shown by the application. Another important facility provided by Lotus Notes NSF to Google Apps Converter is the permission to include as well as exclude the items. The utility brings the option to mark or unmark Deleted Items & Sent Items folders to include/exclude them respectively. In addition, it moves only the data, which is required by users. By doing this selective migration, users can increase the speed of the entire process. It shows a report of completion after completing the process. This report carries information like a number of emails, username, converted calendars, contacts, detected errors etc. It can be saved for future use. The Lotus Notes NSF to Google Apps Migrator has a very simple interface, which makes it easy for any kind of users to use it. It is compatible with all the editions of Windows Operating system. Trial version of Lotus Notes to Google Apps tool provides free migration of 2 users constrained to 15 items per Lotus Notes NSF file folder. Lotus Notes Client should be installed. Lotus Notes Client should not be connected with Domino Server. Google Apps should have provisioning API enable. Google Apps should enable user to use the email migration API. For Window 8.1/8/7 or Vista users, launch the tool as "Run as Administrator". Lotus Notes Client 9.0 or below. Explain the working of Lotus Notes to Google Apps Migrator Tool in Brief? 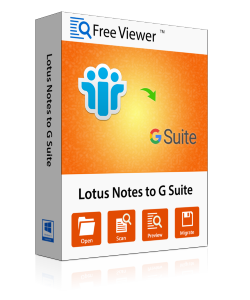 Step 1: Install & Run Lotus Notes to G Suite Migrator Tool. Step 2: Select NSF file and add NSF file or folder. You can also select Domino Server option to connect the server and select users via administrative login. 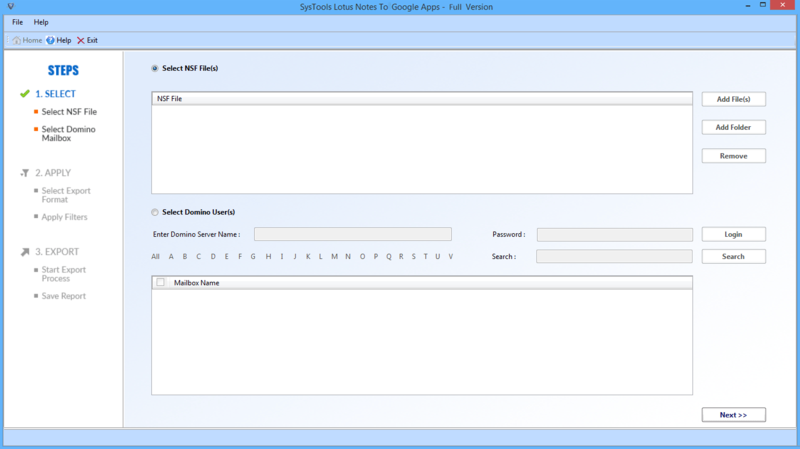 Step 4: Add the desired Google ID and authenticate the account. Step 5: Apply filters and settings and then, click on Export button. Step 6: After the successful export process, all the data items will migrate to respective Office 365 account. Can I export only contacts with the help of Lotus Notes to Google Apps Converter? Yes, this software helps users in migration Lotus Notes applications to Google Apps. Moreover, users can export only calendars, emails, or contacts. How much the tool takes to complete the entire process of migration? The time totally depends upon the amount of data has been selected by you. However, Lotus Notes NSF to Google Apps Migration Tool finishes the entire process in a quick manner. Can this utility work for Windows 7 and Windows Vista? Yes, of course, the tool is a Windows-based application. Therefore, it can be accessed in every version of Windows Operating system. Is it possible to preserve the hierarchy of the folder after the procedure? Yes, this Lotus Notes to Google Apps comes up with a feature using which it is possible to maintain the hierarchy of the folder. Can I migrate NSF to Google Apps in a batch mode at once? Yes, with our tool it becomes possible to move the entire data from Lotus Notes to Google Apps at a time. Will the application work if I do not have Lotus Notes installed on my machine? No, the installation of Domino Lotus Notes is required to perform the entire process of conversion. "I do not have words to explain my thought about Lotus Notes to Google Apps Migration Software. Seriously, it is a must use the tool. The way it has been designed is unique and all the added features make the software remarkable. I would have even lost my job if I have not accessed this utility for NSF to G Suite migration." "I had a bulk of NSF files that I wanted to transfer to Google Apps. However, I did know the relevant manual method or any software to execute this. I have tried to search manual tricks, but unable to find any. Then, I use this program to migrate NSF to Google Apps. It completes the entire task within some few clicks. I want to say a big thank you the entire teams of developers." "I like the interface of IBM Notes NSF to G Suite Migration Tool. As, I am a non-technical person, it was a difficult task for me to complete the migration process with so much ease. I didn't get any difficulty in performing the export process. This task was easy all because of this tool." "Thanks to the FreeViewer team for this wonderful tool. This application was above my expectation level. It takes very less time to complete the process. I must say that Lotus Notes to Google Apps Exporter Tool is great and suggested to everyone who is looking for the solution to migrate data from NSF file to G Apps account."